Rep. Sara Wojcicki Jimenez, at microphone, sponsored legislation to make Springfield the default site for new or vacant state jobs. Gov. Bruce Rauner, left, signed the legislation Thursday, August 9, 2018. Gov. Bruce Rauner has signed legislation meant to bring state jobs back to Springfield. The Illinois government workforce has been shrinking for the better part of two decades. According to the state’s comprehensive annual financial reports, it was down to 62,081last year, from a modern peak of 89,097 in 2001. That’s been rough for the capital city’s economy. But in addition to those job losses, previous governors moved a lot of state gigs to other Illinois cities. Republican state Rep. Sara Wojcicki Jimenez, who grew up in Springfield and represents it in the General Assembly, sponsored the law. 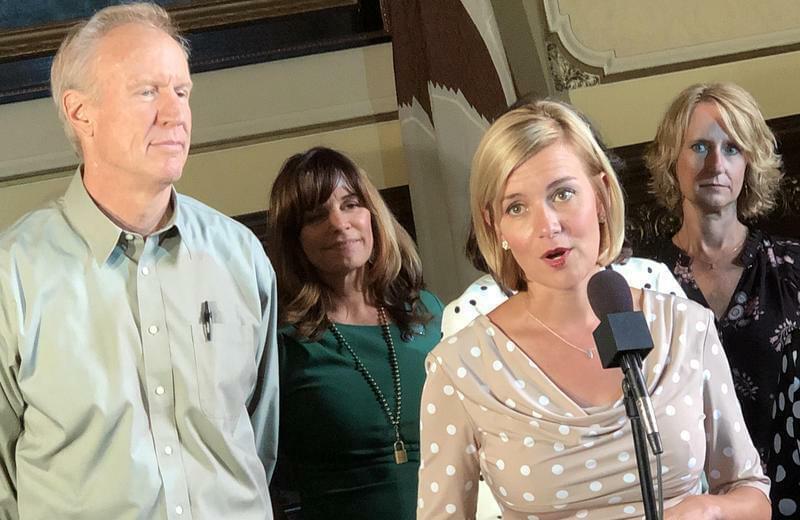 “There’s been a lot of concern among people in Sangamon County about where the state capital actually is,” Jimenez told reporters Thursday during a bill-signing ceremony in Rauner’s office. “Naturally there has to be state jobs all over the state, because we’re a very big, diverse state. But what this bill would do is make the default location Sangamon County unless it can be determined that the job needs to be in another part of the state to best serve the residents,” she said. The state has already identified about 400 jobs that can be moved back to Springfield. But no employees will be forced to relocate — the law only applies to new jobs or vacant positions.